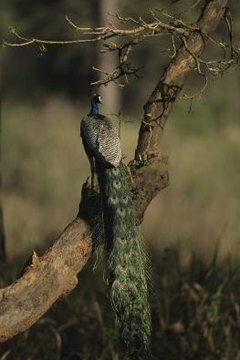 Indian peafowl (Pavo cristatus) are diurnal birds native to India and a few neighboring nations. "Peafowl" refers to both male and female within the species, while "peacock" refers to just the males. The males stand out because of their vibrant plumage. Indian peafowl roam all throughout South Asia -- India, Pakistan, Bhutan, Nepal and Sri Lanka. Their continued existence in Bangladesh isn't certain. Peafowl also have been brought to Singapore, Australia, New Zealand, Florida and the Bahamas and do well there. Their wild population is thought to be steady. The species is of "least concern" for endangerment and extinction in the near future, according to the International Union for Conservation of Nature. Indian peacocks and peahens are generally forest inhabitants. Once peafowl settle on a place to live, they typically don't stray far. They're drawn to airy forests. They prefer sites close to reliable water access, often riverbanks. Peafowl in southern India are especially fond of forests along creeks. Peafowl are also prevalent in areas that have fruit crops, which they frequently eat. They largely favor being away from human activity and disturbance. Peacocks often spend time in tiny groups of males, no peahens. When it comes time to breed, peacocks typically adopt independent lifestyles, leaving their male social circles and setting up their own mating turfs, or leks. Peacocks reproduce with an average of six peahens each year. The reproductive season for Indian peafowls starts in April and ends in September. During this time they often live together within harems. After peacocks mate, they're essentially totally through with their roles as fathers. They no longer interact with the females, and they don't take on any paternal responsibilities. Peahens create nests below shrubs, using components such as foliage and sticks. Clutches can include as many as 12 brown eggs, but usually three to six. The peahens incubate the eggs without the assistance of peacocks. Peafowl tend to become self-sufficient in 8 weeks. The young are known as peachicks.